Hot Topic was cool, then it was a joke, and now it's irrelevant. We're reclaiming Hot Topic's identity by once again making it the destination for underground musical culture. We've taken Hot Topic's iconic t-shirt wall and made it an out of home experience. 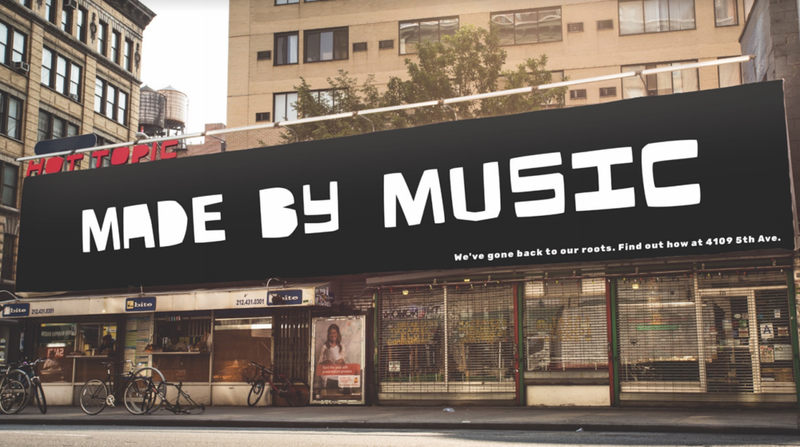 As people buy the shirts, Hot Topic's new tag "Made By Music" will be revealed. By interacting with a Facebook chatbot, you will be able to order a shirt straight to your home or to the local Hot Topic store. Where can Hot Topic make its presence felt on a shirt that's already covered by a band's logo? Oh yea, the tag. This video captures music lovers candid feelings about their favorite shirt and encourage others to share theirs on social media with #madebymusic. Instagram users who share a post wearing their favorite artist t-shirts with #madebymusic will receive a code for 10% off their next purchase. Hot Topic will create a ranking of its best selling shirts to let music fans know which artists are trending. Every week, the Hot4 will be featured on Hot Topic's social media account. Our new store design does away with the clutter of the current layout, and includes a space where people can hang out and talk music. Hot Topic should update its taste in music to encompass artists from all genres who embody the punk ethos that is the spirit of Hot Topic. Hot Topic should get rid of the licensed Disney/Comic Book/Video Game merchandise that is watering down the Hot Topic brand and streamline their offerings to include only music related merchandise.